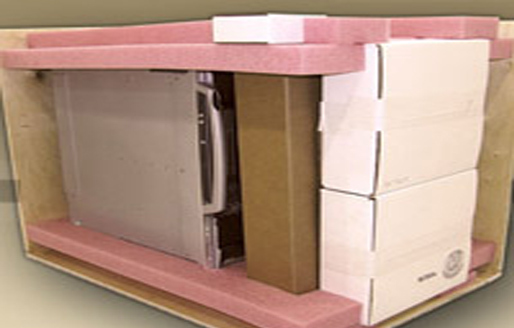 An industrial appliance manufacturer needed a solution for a shipping issue for a maintenance item. They had a return program for a gearbox used in one of their industrial washing machines. Once a gearbox required replacement, the service technician would order a new unit which was packaging in a styrene end capped case. The technician would then place the used gearbox into the case and ship it back to the repair center for rebuild. Because of the weight and handling, the case could only be used several times before it would simply wear out. ProtoPak proposed designing a new case that would solve the wear issue and bring added benefits. Using a gearbox as a model, a new case was designed which utilized a thick walled custom molded pulp design. This environmentally friendly product not only held up better than the original styrene product, but it also absorbed grease and oil, had a much greater life cycle and was less expensive to manufacture. We supplied 2,000 (the first order was for 2,000 but subsequently received a follow up order for 10,000) of these units which measured 11.15" x 9.125" x 4.5". To learn more about this project, please see the table below or contact ProtoPak directly. Product Description These end caps are used to package gearboxes for industrial washing machines. 11.15" x 9.125" x 4.5"